If you have been diagnosed or believe you may have the fungal skin infection tinea versicolor, what treatments are available? Which therapies are most effective and how can you and your doctor make the choice about which treatment is best for you? Tinea versicolor is a common fungal skin infection which produces a characteristic rash. It is also known as pityriasis versicolor and is frequently confused with other skin rashes. While the rash is most common during adolescence and early adulthood, it can occur at any age. Tinea versicolor occurs when the normal skin yeasts, Pityrosporum orbiculare or Pityrosporum ovale, transform (change) into a pathogenic form of the fungus called Malassezia furfur. The pathogenic fungus then works by turning off the off melanin-producing cells in the skin (the melanocytes). Since tinea versicolor is related to the overgrowth of normal (and even protective) fungi on the skin, it is not contagious. There are several different treatment approaches for getting rid of the tinea versicolor rash. Because the yeast inhabits the top layer of the skin, ​the epidermis, topical anti-fungal medications tend to be very effective, at least early on or during the first occurrence of the infection. If the rash is extensive, oral anti-fungal medications may be needed. Let's look at these different treatments individually. Topical antifungal medications are the treatment of choice for tinea versicolor. A number of topical anti-fungal treatment regimens have been shown to produce a greater than 70 percent clinical response rate. This includes prescribing patients 2 percent Nizoral (ketoconazole) cream to be applied once daily for 11 to 22 days. Alternatively, using a 2 percent ketoconazole shampoo regimen (lathered over affected and surrounding areas and left on for at least five minutes before rinsing) also helps when applied once daily for three consecutive days. In addition, 1 percent Lamisil (terbinafine) solution applied twice daily for one week has proven to be effective, as has 1 percent Lotrimin (clotrimazole) solution applied once daily for one week. Oral anti-fungal medications can cause side effects such as nausea or reversible liver damage, but these side effects are uncommon with the short courses of therapy used for tinea versicolor. Oral griseofulvin and oral terbinafine are not effective treatments for tinea versicolor, but a variety of oral treatment regimens have been shown to produce up to a 90 percent clinical response rate. Ketoconazole 200 mg daily for seven days or a single 400 mg dose may be used. After taking the medication, people are instructed to exercise and work up a sweat. The medication works by being delivered to the skin in the form of sweat, so you should not shower for 10 to 12 hours after taking a dose. Fluconazole, a 300 mg tablet taken initially and then repeated in two weeks is also effective. Until recently, dandruff shampoos were the mainstay of treatment for tinea versicolor. They are less effective than the anti-fungal medications and can cause skin irritation, but they are available over-the-counter and are less expensive. A number of regimens have been shown to be effective. This includes sulfur salicylic acid shampoo applied nightly as a lotion for one week or a zinc-pyrithione shampoo regimen (applied daily as a lotion and left on for five minutes before rinsing) for two weeks. In addition, Selsun Blue (selenium sulfide) 2.5 percent lotion regimen (applied daily as a lotion and left on for 10 minutes before rinsing) for one week has proven effective. 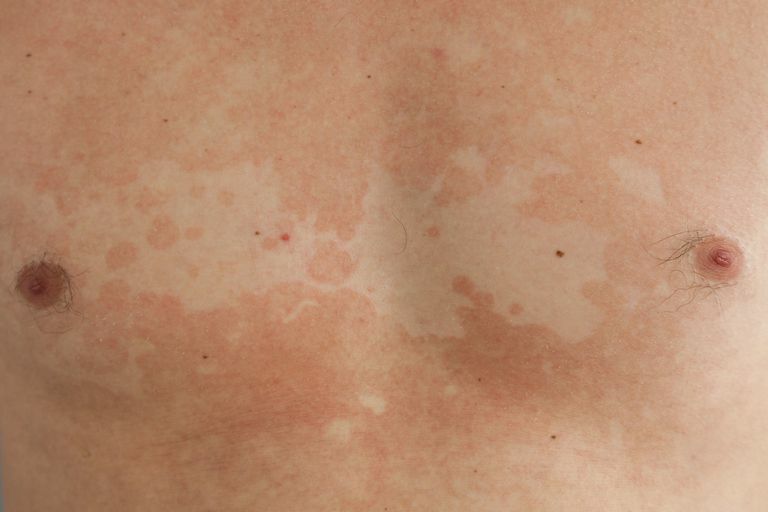 Tinea versicolor often responds readily to treatment, though recurrence is common as noted earlier. While the spots (macules) usually resolve shortly, the changes in pigmentation may take much longer to resolve as the melanocytes need to begin producing melanin again. If you have tinea versicolor, consult your doctor about the variety of treatment options available to you. You and your doctor can discuss the best treatment based on the extent of your rash, how long it has been present, and if it has recurred. Gupta, A., and D. Lyons. Pityriasis Versicolor: An Update on Pharmacological Treatment Options. Expert Opinion on Pharmacotherapy. 2014. 15(12):1707-13.